Public spending on education was 3.2 per cent of GDP in 2012. The Ministry of Education, Youths and Sports in Sierra Leone is responsible for the lifelong education and training of its citizens and co-ordinates education initiatives between government, donors, NGOs and the communities. Tertiary institutions fall under the jurisdiction of the Ministry of Education, Science and Technology. The Education Act of 2002 reflects the normative values of the education system and also expands on the regulatory functioning including the regulation regarding the management of schools. There are six years of compulsory education starting at the age of six. Primary school comprises six years and secondary six, with two cycles each of three years. The school year starts in September. The principal tertiary institutions are Fourah Bay College in Freetown and Njala University, with campuses in Bo and Njala. 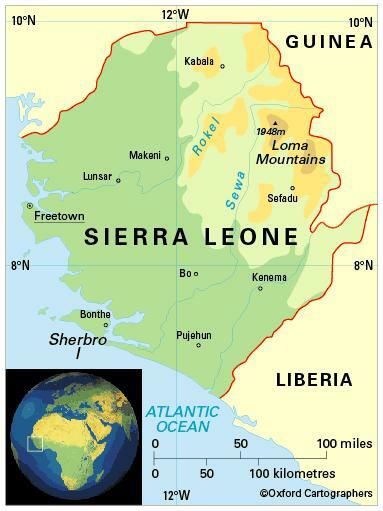 These universities, together with Milton Margai College of Education and Technology (Freetown), Eastern Polytechnic (main campus in Kenema) and other independent tertiary institutions, are all affiliated to the University of Sierra Leone. The country also has a number of teacher-training and technical/vocational institutions providing certificate and diploma courses. Literacy among people aged 15-24 is 62.7 per cent (2012).